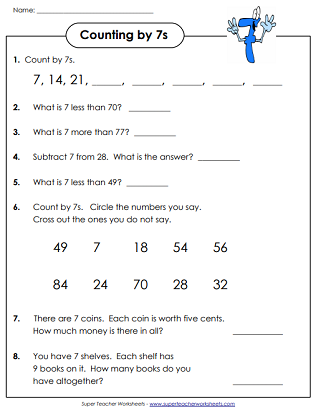 These printable worksheets can be used to help your students learn to count by 7s. Count 7, 14, 21, 28, 35, 42, 49, 56, and so on and so on. Count by 7s and fill in the missing numbers on the number lines with this printable skip-counting worksheet. Skip count by sevens. Write one number in each box. 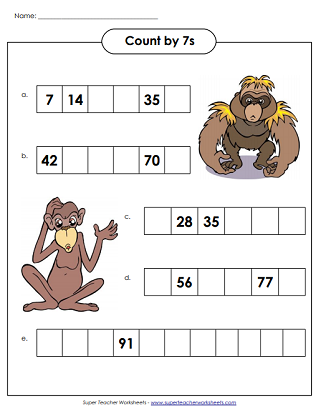 This worksheet features monkey pictures. The line of penguins shown have multiples of seven on their tummies. Write the missing numbers. Skip count by sevens. Write the missing numbers on the helium balloon pictures. Skip count by 7s and connect the dots. 7, 14, 21. 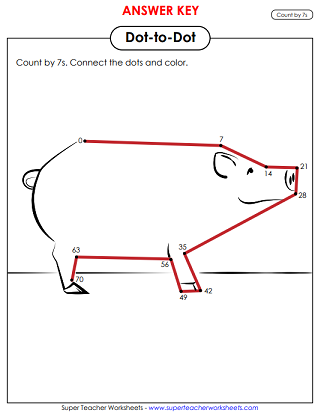 Draw a pig that's lots of fun. Skip count by 7s to fill in the missing numbers on the caterpillar. After you practice skip counting by sevens, answer the math questions and word problems. Help the rocket get to the star by counting by 7s. Write the missing numbers in the circles. Practice counting by 2s, 3s, 4s, 5s, 7s, 8s, 9s, 12s, 25s, and 100s. Practice basic multiplication facts with the printable resources on this page.